Johannes M. Burgers was born and educated in the Netherlands. He received his PhD in both physics and mathematics from the University of Leiden, where he was advised by P. T. Ehrenfest. Dr. Burgers’ research led him to become a leading authority on fluid dynamics, but also studied crystallography alongside his brother, Wilhelm. January, 13, 1895Born, Arnhem (Netherlands). 1918Obtained PhD in Physics and Mathematics, University of Leiden, Leiden (Netherlands). 1918 – 1955Professor of Aerodynamics and Hydrodynamics, Department of Mechanical Engineering and Shipbuilding, Technische Hoogeschool in Delft (Technical University of Delft), Delft (Netherlands). 1931Member, Department of Physics, Royal Acadmey of Sciences. 1946 – 1952General Secretary, International Council of Scientific Unions. 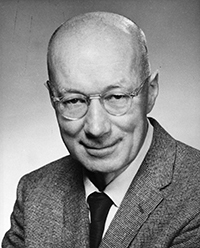 1955 – 1965Professor, Institute for Fluid Dynamics and Applied Mathematics (1955-1965); Retired, Professor Emeritus (1965), University of Maryland, College Park (Md.). 1964Awarded the Bingham Medal, Society of Rheology. July 6, 1981Death, Washington (D.C.). Fluid dynamics and statistical mechanics physicist. Brother and collaborated on crystal lattice dislocation. PhD advisor at University of Leiden. Professor of Aerodynamics and Hydrodynamics, Department of Mechanical Engineering and Shipbuilding. Professor and Retired, Professor Emeritus. Obtained PhD in Physics and Mathematics (1918). Recipient of the Bingham Medal in 1964. Experience and conceptual activity : a philosophical essay based upon the writings of A.N. Whitehead / [by] J.M. Burgers. Het atoommodel van Rutherford-Bohr / Johannes Martinus Burgers. J. M. Burgers Physics Today obituary.